THE positive achievements made in the Irish-language sector were outlined by Sinn Féin Education Minister Caitríona Ruane at the annual conference of Comhairle na Gaelscolaíochta last week. Ruane noted that it was more than a year since she set out her hopes for the Irish-language education sector and the Review of Irish-Medium Education. She took the opportunity to highlight the positive achievements made in that time and her aims for the future. Ruane said the previous Sinn Féin Minister for Education, Martin McGuinness, fundamentally shifted the relationship that education system has with Irish-medium learning. The first statutory recognition of the sector was achieved in the 1998 as a direct result of the Good Friday Agreement. 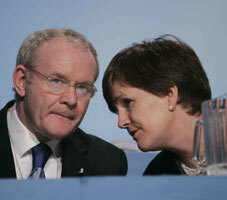 In 1999, McGuinness reduced the viability numbers required to establish Irish-medium schools. This saw the number of children able to avail of Government-funded Irish-medium education in the North more than double to over 3,300. The number of grant-aided schools increased from eight to 22, and units from two to 11. In 2000, Martin McGuinness oversaw the establishment of Comhairle na Gaelscolaíochta and, in 2001, Iontaobhas na Gaelscolaíochta. Both bodies have been instrumental in the development of the sector. Caitríona Ruane said this solid foundation is one on which she has been determined to build on. She pointed out that when she was appointed Minister of Education she inherited a system that was geared towards the needs of just 40 per cent of children. “Every year, thousands of children were failed by the education system. For the most part, these were already disadvantaged children. I was not prepared to tolerate such inequality. “I am delighted to say that last year’s test was the last 11-Plus. It was a system designed 60 years ago and was clearly not fit for the modern world. Not only was it outdated, it was fundamentally wrong, based on academic apartheid, and it condemned the majority of our children as failures. In my opinion, no child is a failure and for that reason alone there will be no further state-sponsored testing at age 11. Over 22 months, Ruane made determined efforts to convince the defenders of selection of the logic and need for change. These were dismissed. When it became clear that there was no prospect of political agreement on ending academic selection, she issued guidance on admission to post-primary schools in 2010. To teachers in some schools under pressure to prepare pupils for unregulated breakaway tests, the guidance is clear. Ruane said it is vital that schools adhere to their statutory duty to deliver the revised curriculum. Recent announcements by teachers’ unions make it clear that many primary teachers will not engage in test preparation. The Education Minister said that fundamental to her programme of change is that Irish-medium education must never again be an after-thought once policy has been designed and implemented for English-medium schools. The Review of Irish-Medium Education will see all-Ireland co-operation expanding for the mutual benefit of children learning through Irish. £1m is available this year and next to develop the necessary resources. The review highlights the pressures on the sector caused by numbers of teachers coming into it, the in-service training available to those working in the sector, and the limited opportunities for self development and leadership within the sector at present. “I have recognised the need for additional teachers, with the result that intakes to the Irish-Medium Post-graduate Certificate in Education courses for both the primary and post-primary sectors have risen from 22 in the 2007/08 academic year to 30 in the 2008/09 academic year. “This is just the beginning,” Ruane said, adding that Irish-medium education will receive the full support of the new Educational and Skills Authority. She said schools throughout the education sector face major deficiencies in accommodation. A great deal of work has been carried out over the past two years to improve infrastructure in existing Irish-medium schools but much more needs to be done. “My department will continue to work closely with Iontaobhas na Gaelscolaíochta and Comhairle na Gaelscolaíochta to bring forward the best solutions we can find,” she said. The review also proposes new options for the development of the sector such as federation. This will support existing and new schools to achieve viability and to secure vital capital investment. It will provide the sector with a stronger leadership base which will benefit teachers, pupils and schools alike. “I believe it is vital that as many options as possible are available to those wishing to avail of Irish-medium education for their children,” Ruane said, adding that there is no “one size fits all” solution to local situations. The minister has asked her department to develop an action plan for delivery of the recommendations of the Irish-Medium Review. She said equality is the key for the sector. This means the system recognising and meeting different needs and that Irish-medium education is part of the system, not apart from it. The Education Minister concluded by saying much work remains to be done.